Every day our fathers, partners, brothers and friends face a health crisis that isn’t being talked about. The Movember Foundation are making the difference to providing help and support for Men who are facing prostate cancer, testicular cancer, mental health issues and suicide. The month of November sees initiatives all over the World, fundraising and awareness raising and local communities coming together to create, donate and share help and resources to support Men facing those issues. In Bristol, Sports clubs including Bristol Bears, Bristol City and Bristol Rovers, along with other local services, have joined forces to raise awareness of issues facing men’s well-being and to support the Movember 2018 campaign. Find out more here and take the quiz to find out how to improve your mental health and be in with a chance of winning signed balls, shirts, tickets and much more. 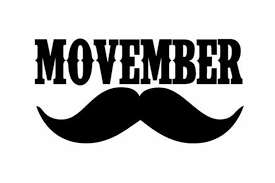 Sign up here and make a difference this November with the Movember Foundation. Men are dying too young. We can’t afford to stay silent.